Work is a family affair around here. Chris Richards, Mimi Hill Shannahan, and Ben Gibson all grew up helping with the businesses built by earlier generations. Today, they work to strengthen those family ties. 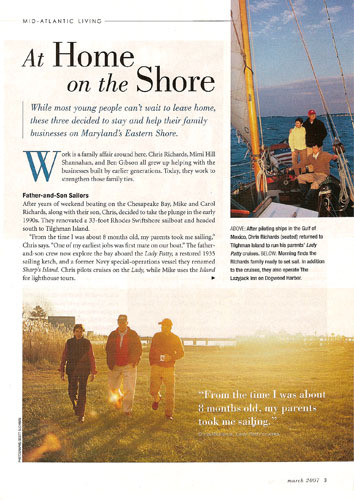 After years of weekend boating on the Chesapeake Bay, Mike and Carol Richards, along with their son, Chris, decided to take the plunge in the early 1990s. They renovated a 33-foot Rhodes Swiftshore and headed south to Tilghman Island. "From the time I was about 8 months old, my parents took me sailing," Chris says. "One of my earliest jobs was first mate on our boat." The father-and-son crew now explore the bay aboard the Lady Patty, a restored1935 sailing ketch, and a former Navy special-operations vessel they renamed Sharps Island. Chris pilots cruises on the Lady, while Mike uses the Island for lighthouse tours. "I spent six years working on oil field boats in the Gulf of Mexico," Chris says. "I got my captains license and came home." Although Chris lends a hand on land, he's usually found aboard the Lady Patty. "I do most of those tours because, after 30 years of sailing, Dad decided to switch to motorized boats and started the lighthouse tours," he says. "But he still loves to sail. Like with me, it's in his blood." When the entire Hill family sits at the Hills Drug Store soda fountain in Easton, theres hardly room for all of the regulars. Thats just the way founder Doc Hill and his son, William Caulk Hill, wanted it. William, also known as Dr. Hill, had three children--David, Pamela, and Mimi--all of whom he put to work in the family business, just as his father did with him. At 81, Dr. Hill is still a very active part of the pharmacy. That start nearly 80 years ago turned into a tradition. Pamela joined her father as a pharmacist in 1969 and helped him run the store until illness forced her to retire seven years ago. Mimi, also a pharmacist, now manages the business and works to maintain the service level established by her predecessors. "I remember walking in here as a teenager, seeing my grandfather and father working, and knowing that's what I wanted to do," she says. "It was like home." These days Mimis 15-year-old daughter, Reilly, helps out behind the counter or at the drive-through window. "I hope to go to pharmacy school or get a business degree and then come back," Reilly says. They've already saved a place for her at the soda fountain. Ben Gibson started his Robert Morris career at the age of 3, picking up trash in the parking lot. At 5, he sold bags of corn to the guests so that they could feed the ducks. "As a teenager, I worked during the season and played tennis in my free time," he says. "That's when I decided I wanted to move somewhere so I could play year-round." After attending Salisbury University, Ben headed to Florida to start an Internet business and to play tennis in the warm weather. But his family--and some seriously hungry ducks--lured him home in 2001. Bens coming home was a gift for us and the inn, says his father, Ken. "His computer skills really paid off." Back in Maryland, Ben developed a website for the Robert Morris. He had lots of energy and ideas, mom Wendy says. He's helped to push the inn to places it might not have gone. For example, thanks to Ben, they now ship fresh crab cakes nationwide. He also convinced his parents to start selling James A. Micheners novel Chesapeake. The author wrote the outline for his book about the Eastern Shore while dining in their inn's Colonial Tavern. For information on The Lazyjack Inn on Dogwood Harbor (5907 Tilghman Island Road, Tilghman Island), visit www.lazyjackinn.com or call 1-800-690-5080. For information on sailing schedules and reservations aboard the Lady Patty or lighthouse tours on the Sharp's Island, visit www.sailladypatty.com or www.chesapeakelights.com, or call 1-877-699-8837. Hills Drug Store (30 East Dover Street, Easton) is open 8am-6pm Monday-Friday, 9am-3pm Saturday. Call 410-822-2666. For information on the Robert Morris Inn (314 N. Morris Street, Oxford), visit www.robertmorrisinn.com or www.bestcrabcakes.com, or call 1-888-823-4012.